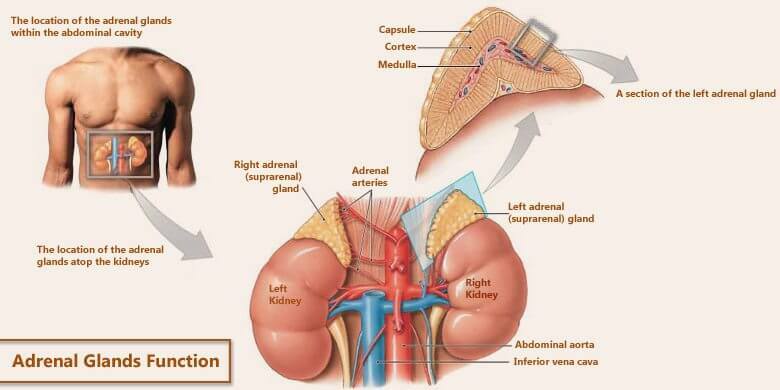 Adrenal glands hormones are responsible for all the adrenal glands function. Here is the brief description of the hormones that the glands produce. Here you’ll also learn about the specific adrenal glands function that each hormone performs. Just read on. Aldosterone belongs to the class of mineralocorticoids. They hormones are responsible for maintaining the balance of salt and water in the body. Therefore, aldosterone is mainly responsible for the regulation of blood pressure. It affects the kidneys to control the amount of minerals reabsorbed into the blood during the formation of urine. This is one of the important hormones that the adrenal gland produces. Cortisol plays an important role in the adrenal glands function. It is a glucocorticoid hormone and is responsible for the metabolism of glucose and other carbohydrates. It also helps in the metabolism of fats and proteins. Hydrocortisone hormone is another name for this regulatory substance. Assisting the immune system is an important adrenal glands function. Corticosterone is another glucocorticoid. It works along with cortisol to aid the immune system of the body. Corticosterone also fights inflammation. The main androgenic hormone of the cortex region is androstenedione which is a precursor for testosterone. The latter plays a significant role in the development of secondary male sexual characteristics. The medulla region is responsible for the production of two important hormones which assist the adrenal glands functions. They are: adrenaline and noradrenalin. Here follows a brief overview of each of them. Epinephrine is another name of adrenaline. The glands secrete it in response to stress, danger or excitement. Adrenaline produces a set of effects which prepare the body for “fight or flight”. The blood glucose level increases in order to make the source of energy readily available for the body. Moreover, the heart beat increases. So the blood pumping becomes faster throughout the body. It provides oxygen and other nutrients, especially to the muscles. Another name for noradrenalin is the norepinephrine. It causes vascontriction of the blood vessels, leading to a high blood pressure. Norepinephrine also acts under stress conditions along with epinephrine to prepare the body for situations of fright or danger. It is a hormone which also acts as a neurotransmitter and affects the heart rate.